I really believe all this about the power of asking questions. I know all this, from both experience and theory. And yet earlier this year, I was astonished to observe the power that the right question had to compel and drive my own curiosity on a topic that had previously found distinctly un-interesting. Provenance: Comes from the USGS on-line spatial data for Massachusetts, https://mrdata.usgs.gov/geology/state/map.html?x=-71.8089194224132&y=42.2562234015901&z=8#. My family and I moved to eastern Massachusetts a little more than four years ago. In the course of settling in, I made some modest effort to become familiar with the landscape and the vegetation and the waterways and the placement of the little towns onto the landscape. My eyes became accustomed to spotting ways that the Pleistocene glaciation had overprinted the landscape, disrupting the drainage patterns and plopping kettle hole lakes and eskers down here and there. But I found myself unable to drum up any interest whatsoever in the bedrock geology. 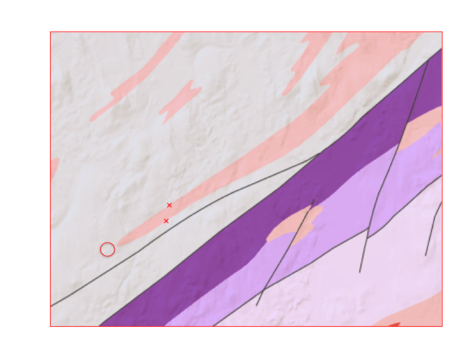 I read up a bit, and all that stuck from my reading was that we are sitting on the remnants of a old orogenic belt with lots of mashed together exotic terranes, that looks like a big mess on a geologic map. Outcrops are few and far between, the bedrock geology in general doesn't control the landforms around here, or drive the economy or do anything much to command my attention. Not interesting. 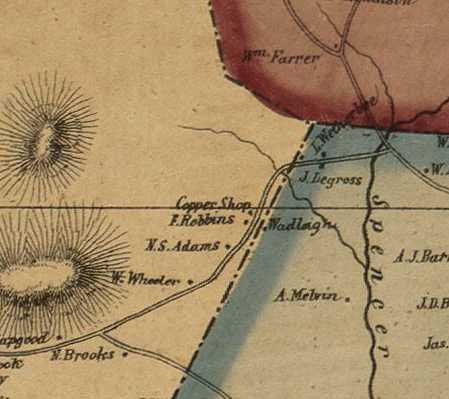 Provenance: Image is a very small portion of a large map of Middlesex County MA, held at the Leventhal Map Library of the Boston Public Library, and available in an interactive form at http://www.leventhalmap.org/id/12690. Reuse: According to the Leventhal Library website at http://www.leventhalmap.org/faqs, their historical maps (prior to 1923) are not copyrighted. But then, one day, a chance-encountered web link brought me to an 1856 map of Middlesex County, my new county. The wonderful interactivity established by the Leventhal Map Library let me zoom in to the exact crossroads where we now live. Our 1980's-vintage house wasn't there--but our neighbors' house was, labelled "F. Robbins." And just beyond the neighbors' house was another dot, labelled "Copper Shop." How interesting. What might that be? I asked our neighbor, who is an amateur local historian when he's not being an MIT engineering professor. Dave said that another neighbor had once pointed out a pit in the ground back in the woods and said that it was an old copper mine. This really grabbed my attention. We live near Concord (as in the battle of Lexington and Concord of Revolutionary War fame) and the landscape is littered with old stone walls and foundations of colonial vintage. But a copper mine? My last (and only) economic geology course was in 1970, but my fuzzy mental map of copper localities placed them in the Cordillera and other mountain ranges. Was it at all plausible that there could actually be a copper mine out behind our house? Why would it be there? This question grabbed ahold of my mind and wouldn't let go. I spent a long evening with my laptop and the Internet, in front of the fire, chasing answers. I found my way to a website for prospectors, Diggings.com, which told me that there were two known deposits of copper in Middlesex County. Neither was my "Copper Shop," but they were nearby, in the adjacent town of Carlisle. 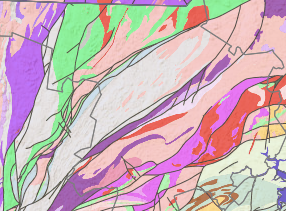 I went back to that previously boring geologic map and learned that we sit on the Nashoba Terrane, a lozenge-shaped, fault-bounded sliver. The first source I looked at said that its origin was "enigmatic," but a more recent source, said it was a Paleozoic arc/back-arc complex. This was promising; here was a tectonic setting that could have supported hydrothermal fluids capable of forming an ore. Our house sits on the Nashoba Formation, which is gneiss and schist metamorphosed from volcanogenic sediments interlayered with limey marine sediments. X's are Digging.com copper localities. Circle is area behind "Copper Shop." Pink is Andover granite. Grey is Nashoba Fm (gneiss and schist). Provenance: Basemap is USGS interactive geologic map of states. Annotations by Kim Kastens. USGS map is public domain. I positioned those two Diggings.com copper localities on the geologic map. Both of them fell on the contact between Nashoba formation and a finger of Andover granite that comes down from the northeast. And then, the aha moment: that same finger of Andover granite comes almost all the way down to our house. The "Copper Shop" sits just beyond the very end of the Andover granite, in a perfect position to receive mineral-laden hydrothermal fluids escaping from the intruding magma. A lovely, coherent story, a beautiful closure to my question. So why was this particular question so powerful for me? What did it keep me up past my bedtime wandering through parts of the web I would previously not have found interesting, driving me in search of an answer? First, this was a instance of "place-based learning," in which the content concerned a geographic locale of interest to the learner. The efficacy of place-based learning in engaging learners is well documented. If so, this was an extreme case of the place-based engagement phenomena. I was notably non-interested when the spatial connection to myself was on the scale of 10-100 miles. I only got interested when the phenomenon under consideration was about 200 yards from my house. My second thought emerges from the student-generated-question project, during which we have developed a taxonomy of student question types. One of our broad categories is "Causality." Within "Causality" fall questions about why is the Earth the way it is, the way the data show? One type of "Causality" question is "Why doesn't the data match my mental model?" My copper-mine question falls in this category. My mental map of copper localities did not include any in flat, tranquil, glaciated Massachusetts. The "copper shop" dot and report of an old copper mine out behind our neighbors' house violated my mental model. The discrepancy between the expected and the observed made for a powerful question, a question that lured me into an extended bout of curiosity-driven self-education. As we work on our taxonomy of student-generated question types, I'm inclined to elevate "why doesn't Earth match my mental model?" to the top of generative questions, questions that can launch a fertile inquiry. 1856 Map of Middlesex County, Massachusetts, by Henry Francis Walling, publisher: Smith & Bumstead. Original is 146 x 147 cm. interactive online version at http://www.leventhalmap.org/id/12690. USGS State Geologic maps interactive compilation.